Had a nice surprise this morning when I opened up my Ravelry design page; my Knit Wrap was just added to the Knit and Crochet Now website and is available for free. It was the middle of September when I was asked to design two projects for Knit and Crochet Now, one was this wrap and the other is a Rug I will talk about later. We were actually in Disneyland at the time celebrating my milestone birthday when the email came in. Knitting for a T.V. show is such an interesting process, for those of you not familiar I will elaborate a bit. They had a definite idea of what kind of design they desired for the show and I was more than happy to extrapolate from the pictures that were sent over. First you have to knit the full sample and write the pattern, then you have to knit step-outs. Step-outs are the small samples of knitting that the host works on during the show to explain how to work the pattern. Basically it is breaking the pattern down into the most relevent parts and making small examples of those parts. Then carefully labelling each section and adding a description of what part of the pattern each step-out corresponded to and attaching it to the correct piece of knitting. This wraps works up quickly, it took me 3 days of knitting but I was knitting like a mad banshee since the deadline was rather closeby (what with the notice being in the middle of the holiday and all). The stitches are simple; garter stitch, eyelets and knotted openwork. The collar is worked in garter stitch with stitches bound off incrementally to create a picot edge. 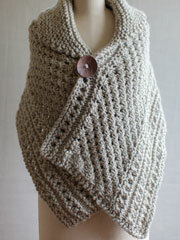 This pattern is free and available on the Knit and Crochet Now website, enjoy!